Lost City Asks "Who Goes to The Famous Oyster Bar?" I thought, by finally dining at The Famous Oyster Bar, I might crack this mystery of a restaurant, which has dumbfounded me for 25 years. Who owns it? How have they managed to hang on to this prime piece of real estate (54th Street and Seventh Avenue) for more than 50 years? Do they own the building? What's their secret? I have been able to uncover little on my own, because it seems that no one has ever written the story of the longstanding restaurant, in either newspaper or guidebook form. But I left discovering only that the place has been owned by the same Greek family since 1959 and has always been in the same location. There are no framed reviews or stories on the walls that would have told me more. And the waitresses are not forthcoming. 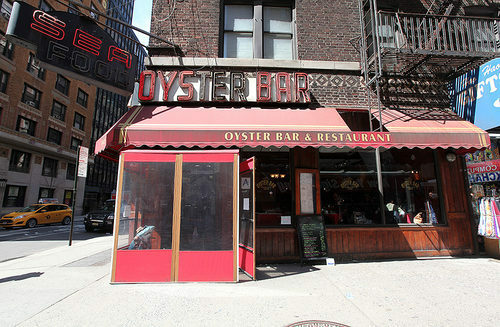 After digging through newspaper archives and finding nothing about the Famous Oyster Bar prior to the 1980s (the results of health inspections, mainly), I begin to doubt the joint's story. 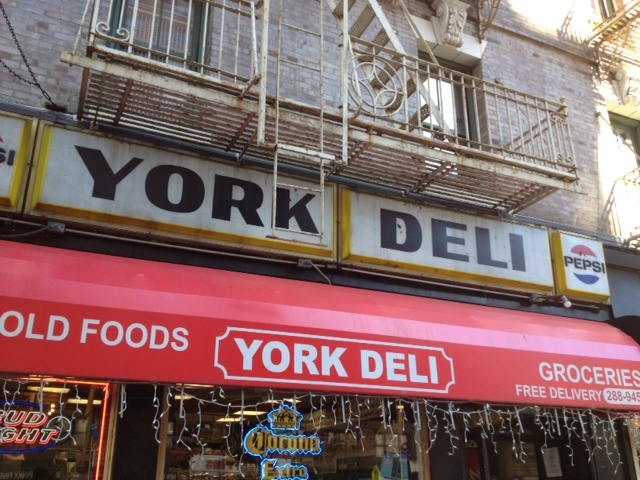 Maybe it didn't open in 1959. Since the idea of it's being a "famous" restaurant is obviously a fantasy, maybe the owners also made up the founding date. The only think dissuading me from this theory are the neon signs, the only thing about the Oyster Bar that does look like it's been there since 1959. Labels: midtown, The Famous Oyster Bar, who goes there? Just the Pepsi sign, I mean, not the awning. Bold. Simple. In Yorkville. I haven't done one of these features in a while, but I couldn't pass up the chance to showcase this little York Avenue gem of a storefront. It's the old-school signage that primarily makes it, of course. (That sort of sign that lists exciting attractions found inside like "Newspapers, Hot Coffee..," etc., never gets old.) The seven-digit phone number, hanging sign and happy riot of color (blue facade, red awning, yellow sign) all contribute to the charm. 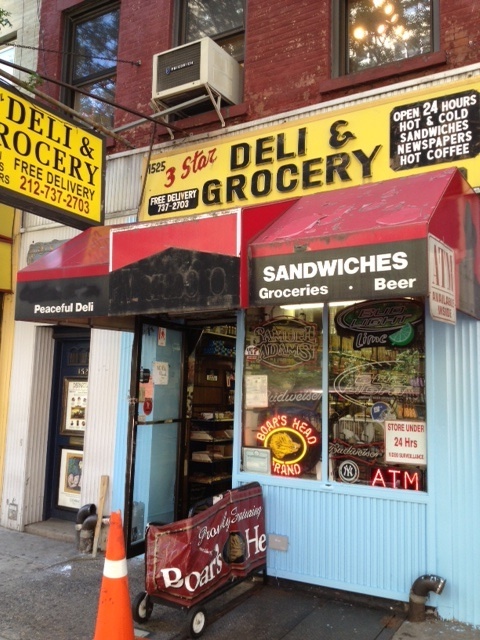 The cryptic "Peaceful Deli" written on the awning adds a bit of mystery. And the name's not to be discounted. 3 Star Deli & Grocery. I guess that's according to a three-star rating system, right? Here are some previous "Perfect Storefront" features. Looking back, I've posted more than I thought. 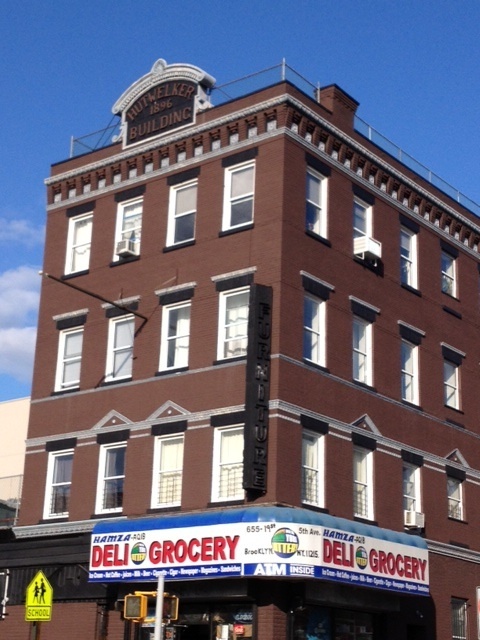 The Hutwelker Building is a handsome, simple, red-brick, four-story structure on Fifth Avenue and 19th Street in the South Slope. You'll see it's odd name—and that it was erected in 1896—if you crane your neck and look up to the cornice. And, if your eye is sharp, you spy what sort of business it used to hold from a darkened, barely noticeable, vertical sign running down the corner edge: Furniture. I was surprised the other day, walking down Fifth Avenue in the South Slope, to spot a familiar blue and yellow awning I had been used to seeing in Bay Ridge. 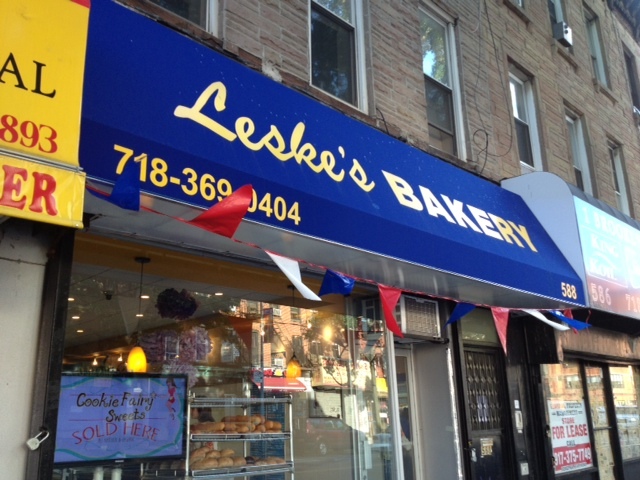 It was unmistakably Leske's Bakery, a Swedish icon from the southern edges of Brooklyn which, after briefly closing in 2011, was bought by new owners and reopened. Now, it seems, the owners are intent on expanding. This new outpost is the first of what a clerk told me the owners hope will be a few new Leske's around the city. It's a nice turnaround for a classic Brooklyn business that very recently was on the brink of extinction. The layout inside is very similar to that of the Bay Ridge store, with the counter and shelves of delicacies to the left as you walk in. I had a black and white cookie, and an almond danish, both of which were fresh and delicious. (I'm not a fan of the iconic black and white city, but I will agree with what others have said, that this is the best example in the city.) I had been unaware of the Leske's tradition of serving free coffee from 5 a.m. to 7 a.m. every day, but apparently this is so. You can always depend on Block Drugs. No matter how much the East Village changes, no matter how many stores come and go and Second Avenue, the 128-year-old corner druggist with the huge neon sign is always there at the southwest corner of Second and 6th Street. Until now. No, Block isn't going away. It's actually expanding. 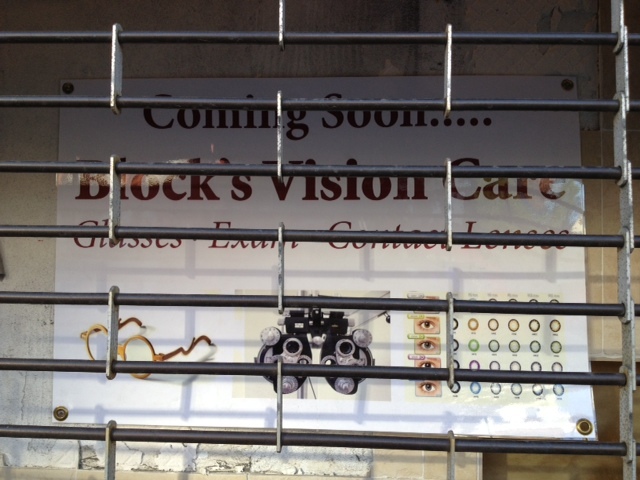 A sign behind the roller shutter of the building beside it tells us "Block's Vision Care" is "Coming Soon." What a pleasant surprise that one of the city's oldest small businesses is thriving and growing, rather than shrinking and disappearing. 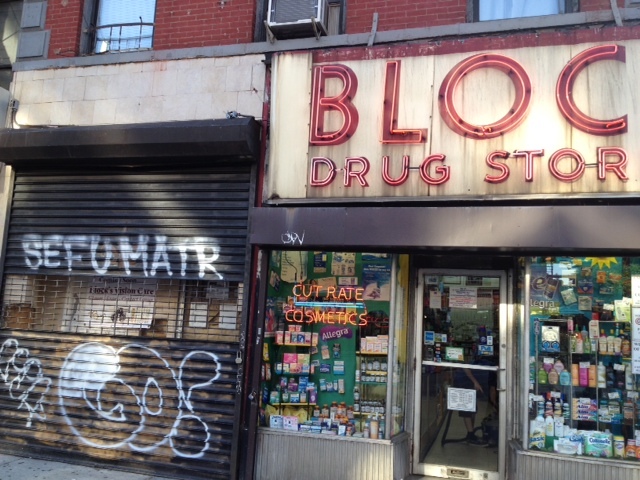 The drug store is currently owned by Carmine Palermo, whose father bought the business in 1962. According to a past article, the business was supposed to open in April. Obviously, it's taking a little more time. 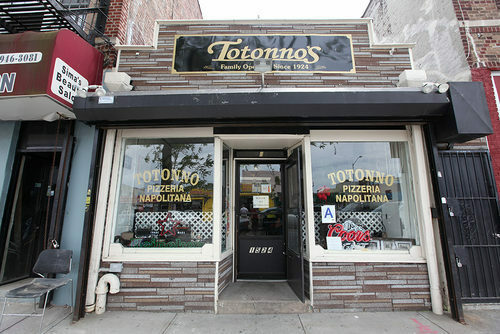 Lost City Asks "Who Goes to Totonno's?" Labels: coney island, totonno's, who goes there? They're dropping like flies, the old-school Manhattan dives. 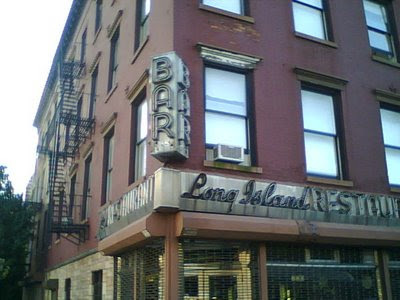 The Mars Bar, the Holiday Cocktail Lounge, the Emerald Inn. 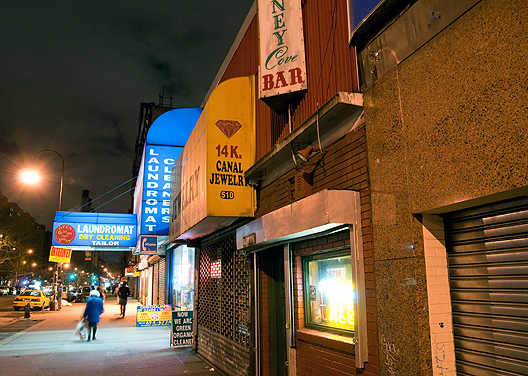 And now the Blarney Cove, a narrow slice of drunken darkness on 14th Street and Avenue A. The property has been leased to another company, and the bar has posted a closing date of June 30. The bar has for some time been surrounded by vacant storefronts. Apparently, the whole stretch of street is now earmarked for developed. Lovely. No idea on the age of this place. My guess, judging by the decor, is a birthdate sometime in the 1970s. But the space has probably been home to a bar far longer than that. The long-dormant inside—the interior of which is a perfectly preserved 1950s-era bar and diner—had been undergoing a renovation for the past few months. I have no first-hand information on the undertaking, but my understanding is that the new proprietors intend to preserve the look of the place, including the signs. (Indeed, one of the stipulations of the Alperin family, which has long owned the building, and used to run the restaurant, is that anyone who occupied the space wouldn't be allowed to change a thing about the decor. This led to may would-be tenants being shot down over the past five years.) That said, I suspect the signs have been taken down for restoration. Maybe we'll be the first generation in decades to see that cursive neon lit! UPDATE: As I suspected, the neon is being restored—according to a reader—at Let There Be Neon. Also, I walked by yesterday, and apparently the signs had been so long a part of the building that, when they were removed, chunks of plaster crumbled and fell to the sidewalk.